You know how to change the opacity value in Adobe Photoshop and Photoshop Elements, right? Simply highlight the opacity value at the top of the Layers panel and type in what you want. Easy peasy! But, did you know there are at least eight opacity changing shortcuts available to help speed up your workflow? I’m sure you know some of these by heart, but you might not know all eight. Check them out and feel free to add any additional insight in the comments below. The image above shows a photo at 100% Opacity, 50% Opacity, and 75% Opacity. The photo is on top of a white textured background paper. Click to drop down the slider, then drag it back and forth. This will change the Opacity value one percentage at a time. Click on the drop down arrow again to close the slider. Click once on the Opacity value, then press the Up/Down Arrow keys. This is nice when you just want to see what difference a few percentage points can make. Nudging one-by-one can get tiresome if you don’t need just a small adjustment. If you’d like to go faster, hold down the Shift key while nudging. That will adjust the Opacity value up or down in 10% increments. No clicking necessary. Typing just a single number will change the Opacity to a round number. For example, if you type a 1, you get 10%. Type a 7 to get 70%. Type a 0 to get 100%. 00 gives you 0%. If you type two numbers, you will get that exact Opacity value. For example, type an 8 and 9 in quick succession, and you will get an opacity value of 89%. If there is an Opacity value in the Tool Options of the active tool, that Opacity will change. 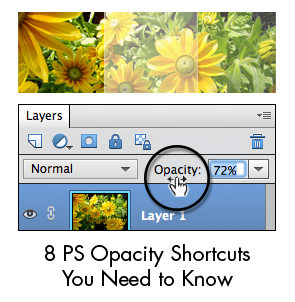 If there is not, the Opacity in the Layers panel will change. If you already have your mouse in hand, the scrubby slider might be what you need to speed up your workflow. Instead of clicking on the Opacity value and changing it, you only need to click and “scrub” back and forth on the word Opacity. The value will change one percentage at a time as you scrub. Sometimes the Opacity values are a little jumpy when scrubbing. If that drives you crazy, try adding the Alt key (Mac: Opt key) while scrubbing to have greater control of how fast the values go up or down. Add the Shift key to the scrubby slide, and you’ll find yourself scrubbing in 10% increments. Doing this will take you from 100% to exactly 50% in no time flat! There you have it. These are all I could come up with. Maybe you can think of more? Save this info for later or share it with a friend. Here is an image you can Pin or share. Found out a new technique! Thanks for this. I knew most of these but there are several I didn’t know. Question: I updated to Photoshop CC this year and I now have trouble using keyboard shortcuts to return the opacity to 100%. This is something I do frequently so it’s very annoying. Typing 1 or 10 sets opacity to 10, but quickly typing 100 sets it to 0. Frustrating! Hi Corinne. 😀 Great question. if you want 0%, type 00. I have come so far with your help…sometimes I need to be reminded of the basics like this one. Thanks. Save this info for later or share it with a friend . . .
but I can’t figure out how to save it. Is there a button or some lonk I am missing? Sorry for that confusion. We have been working on a good link solution for our blog posts. We are close, but not quite there. I am on a Mac. If I were going to save a post for later, I would press Cmd P (to print) and Save as a PDF. You may want to Google the different options for your computer’s browser. Excellent, thank you! I’m always amazed at how much I still DON’T know about Photoshop … especially these “simple” little tips that make a lot of difference. Thanks again. With all the multiplicity in Photoshop (elements), none of us scrappers should ever get Alzheimers! Thanks for the skill set on setting opacity! Your tutorials are the best! I always look forward to the new ones. Thank you, I always learn more than I knew before! Wonderful tips Jen! I learned a lot. Thanks so much!! You win! That’s a lot more than I was aware of. You win! That’s a lot more than I was aware of! Thanks! Thanks for the tips. I learned some new shortcuts today. For your information, #3 and #8 are identical tips. Thank you for these tips. Some I knew, some I didn’t. I always look forward to your tips! Have a great day.